Where is Don Draper when we need him? Draper, of course, is the iconic 1960s advertising executive who stars in the hit TV series, Mad Men. He’s a chain-smoking, hard-drinking, womanizing city slicker of questionable morals who occasionally does something brilliant. Perhaps his most memorable advertising accomplishment occurred when his firm, Sterling Cooper Draper Price, lost its lucrative account marketing Lucky Strike cigarettes. I wonder what the man who wrote that would say about the full-page ad that appeared in a recent issue of Parade magazine, a slim Sunday supplement that is inserted in many of the nation’s largest newspapers. 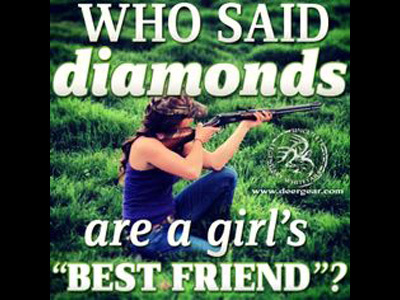 The ad headline reads: “Who Says Diamonds Are A Girl’s Best Friend?” Above the headline, in four-color glory, is a picture of a rifle. I guess there are some women who would not find this silly. Personally, I find it a frightening example of a new marketing trend that is being promoted by gun manufacturers, their lobbyists and trade associations, and the NRA. That trend is to promote firearms as an everyday accessory; something we can’t leave home without. How else to explain the pistols in pastel colors? The purses with a special compartment for a handgun? The child-size rifle with “My First Rifle” in rhinestones? The recent emphasis on open-carry, which means that we can meet up with gun-toting grannies in the supermarket? Don Draper the advertising guru would undoubtedly find this a marvelous marketing strategy. Make people think of a firearm as a necessary accessory, like a scarf or a billfold. Make people think that “everyone has one.” Make people feel that they deserve something special. Develop the product line to fit into various niches: a beginner rifle for kids, a sophisticated firearm for the working woman, an assault weapon for the testosterone-fueled adolescent. We’ve had you in our crosshairs for a while because we know that you like to feel special. You like to feel important and powerful. The firearms that we have been advertising can make you feel that way. But what we haven’t told you is that these weapons can also make you, or someone who gets in your sights, dead. We are going to dodge the bullet of responsibility and resign this account right now, because we don’t believe that buying a gun should be as easy or as pleasurable as buying a candy bar. Arms should be for hugging, not killing. Wish you were here, Don Draper.